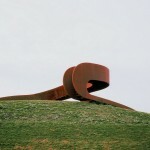 A rusty steel ring is gently draped upon a grass hill in Carnisselande, a Rotterdam suburb. 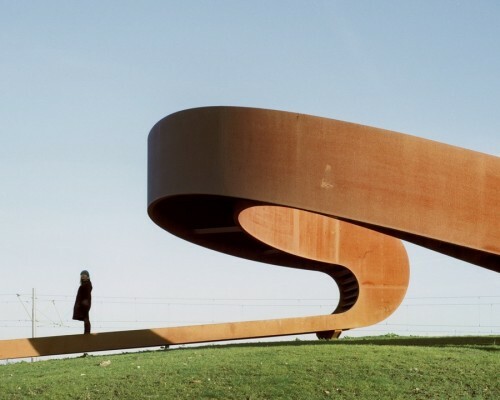 It’s a giant circular stair leading the visitor up to a height that allows an unhindered view of the horizon and the nearby skyline of Rotterdam. 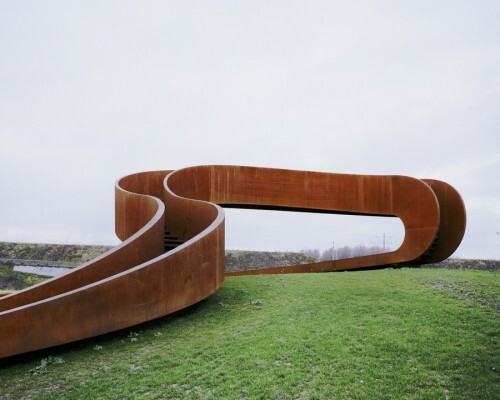 The path makes a continuous movement and thereby draws on the context of the heavy infrastructural surrounding of ring road and tram track. 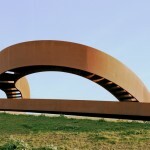 While a tram stop represents the end or the start of a journey, the route of the stairway is endless. However, the continuity and endlessness have a double meaning. 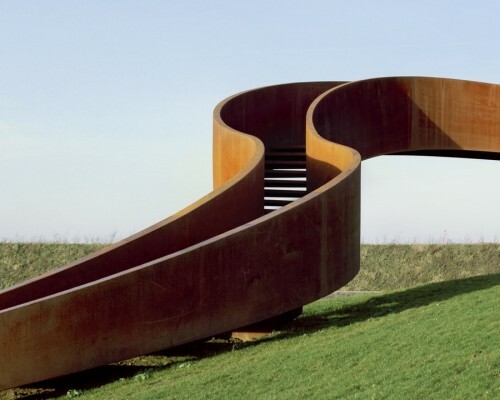 Based on the principal of the Möbius strip, the continuous route of the stair is a delusion: upside becomes underside becomes upside. It has only one surface and only one boundary. 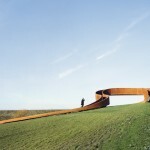 The suggestion of a continuous route is therefore, in the end, an impossibility. 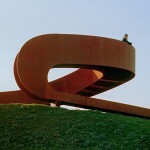 The Elastic Perspective is a local art plan for which NEXT architects designed this stair. 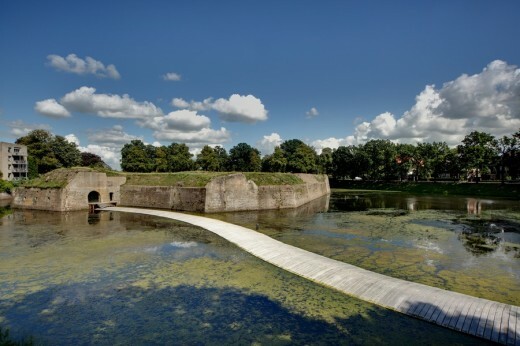 The project reflects on the ambiguous relationship of the inhabitants of the Rotterdam suburb Carnisselande with their mother-town, which is expressed in both attraction and repulsion. 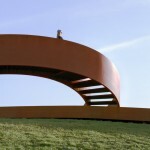 ‘The view on Rotterdam is nowhere better, then from Carnisselande’ as one of the locals put it. 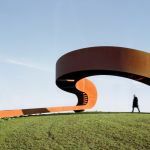 The circular stair offers the suburbians a view on the Rotterdam skyline – only a couple of kilometers ahead – but forces them to retrace their steps back into their suburban reality. 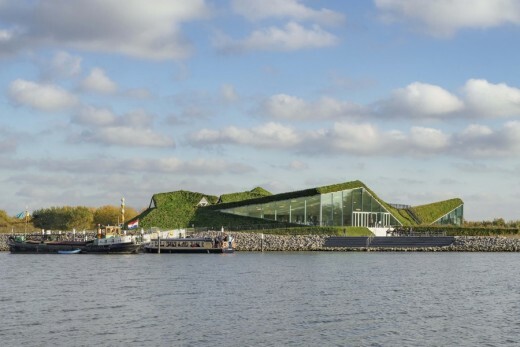 Rotterdam, by tram just minutes away, but in perception and experience tucked behind infrastructure and noise barriers; far away, so close.